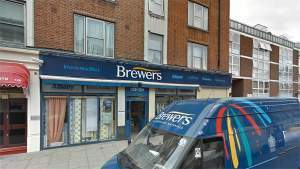 The Brewers Edgware Road showroom has been providing north London painters, decorators and private customers with paints and more for around 150 years. Some of our longest-standing customers still refer to us as Simpsons, which is worth remembering in case you’re asking tradespeople for local paint supply recommendations. We stock a huge supply of designer and trade paints, decorating equipment and accessories, and hundreds of wallpaper books from which to choose the perfect interior finish. Our disabled customers can park directly outside the front of the store on Broadley Street, even in this area where parking is at a premium. Broadley Street is one-way, opening out onto Edgware Road with a Post Office on one corner and Bake & Cake on the other. We’re close to Paddington Green Police Station and only a two-minute walk from Edgware Road tube station. From Bell Street turning on to Penfold Street, take the second turning on the left on to Broadley Street. Continue on and the store is at the end of the road on the right hand side. From Orchardson Street turning on to Penfold Street, take the forth turning on the right on to Broadley Street. Continue on and the store is at the end of the road on the right hand side.